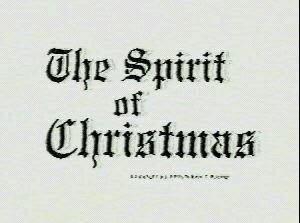 The Spirit of Christmas is a five-minute animated video, telling the stories of four young American boys, three cultural icons, a crowd of onlooking children, and a large group of rats with antlers. It is truly one of the most moving pieces to ever escape two men's video equipment. This movie is not recommended for anybody with a slow network connection, or for pregnant women under the age of 15. Dave Weber for use of his Mac and digitizing skills. Tom Saleh for the Jaz Drive that kept DB from having to buy a new hard drive to digitize the thing. Jesse Olson for getting the ~6th generation tape from Amy Ryan, who got the ~5th generation tape from Jay Kreibich, who got his from "an ex-co-worker, who made his copy from a client's copy, who got his copy from 'some friends who work in a studio in LA'." Tim Skirvin for beginning distribution, and letting us eventually take over the website. Everyone who's ever run a mirror site (which would be a lot of people). Thanks to you, we got this show on the air.